Wash and peel the skin of potato.Cut the head & tail portions slightly & slice into 1/4 inch thick rings.Set aside.Do not slice too thick.It won’t cook properly.Use a sharp knife for slicing. In a wide bowl, mix all the flours,spice powders ( Use Kashmiri chilli powder to avoid food color), Ajwain or cumin, salt, cooking soda and add water to make a slightly watery batter( like dosa batter). 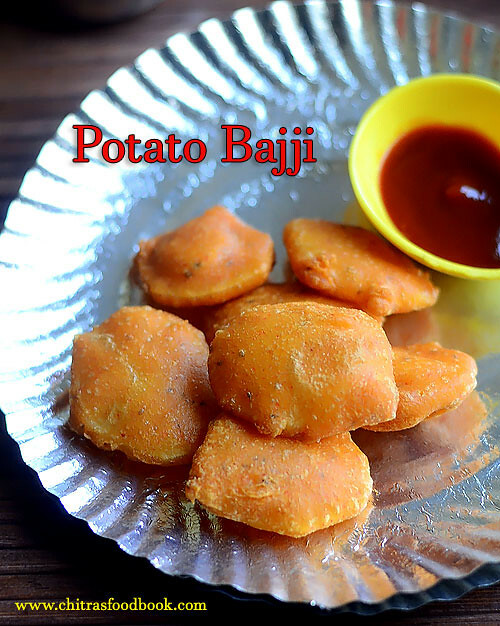 If u make it too watery, bajji will have tails.At the same time, thick batter yields hard bajjis.The batter should be thick & flow like a ribbon.It should coat the potato pieces well.Adjust water & flour accordingly.Dip the potato rings in the batter & coat it well. Heat oil in a kadai and check with a drop of batter to find the correct heating point.i.e. If u put a drop of batter, the batter will rise immediately and floats on top. As soon as u get this heating point, simmer the flame and drop the potato slices coated well with batter. 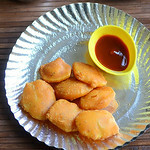 Deep fry till the bajji color changes golden brown and the bubbles ceases.Flip it and again cook for a minute. Drain & remove in a tissue paper. 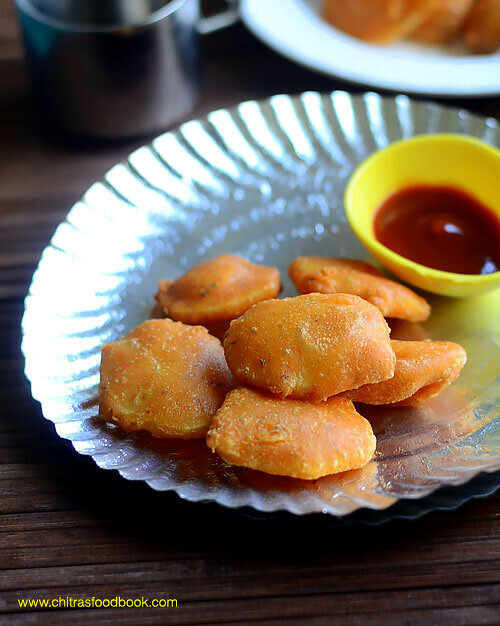 Addition of food color gives a nice color to bajji as u see in stalls.But use Kashmiri red chilli powder if you want to avoid food color and get natural bright colored bajji. Please don’t skip adding soda. It gives a puffy,soft bajji. Make sure u don’t add much because bajji will be very oily and it is unhealthy too. Adjust the consistency of batter. Batter should not be too thin or too thick. If ur batter has become too thin , add besan & rice flour in 3:1 ratio and adjust the batter.If it is too thick add more water. Always add the extra water using a tbsp & check it. 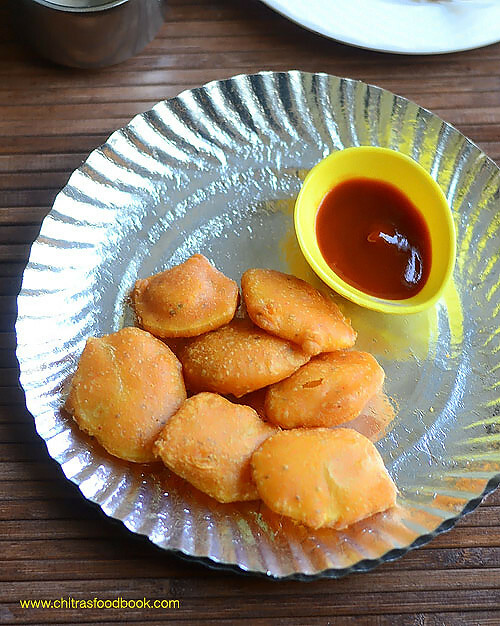 Enjoy hot, crispy, puffy Potato bajji for your teatime ! Yeah !! bajji's are favorite of everyone. Looks super yummy.